SOMERSET, N.J., Sept. 7, 2015 – Data from preclinical and clinical studies have provided substantial evidence that 5α-Reductase inhibitors (5α-RIs) such as finasteride and dutasteride cause loss or reduction of libido, increase the risk of erectile dysfunction and ejaculatory dysfunction, and may contribute to the onset of depression. These agents interfere with the biosynthesis and metabolism of neurosteroids and may adversely affect mood, stress, and anxiety and potentiate the onset of depression. 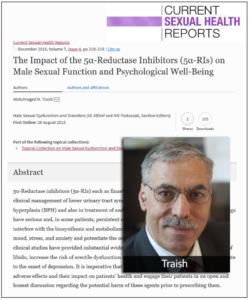 These findings, presented in an article titled The Impact of the 5α-Reductase Inhibitors (5α-RIs) on Male Sexual Function and Psychological Well-Being, appear in the August 2015 edition Current Sexual Health Reports. "The data available in the contemporary literature on the adverse side effects of 5α-RIs do not conclusively suggest that these agents are safe to use in various subsets of patients. If the claimed safety profile indeed exists, then why there are so many patients treated with 5α-RIs seeking medical treatment for restoring their sexual function or recovery from their depression? "Thus, the assertion that these drugs are well tolerated and safe is only in the eye of the beholder, and it is warranted to carefully reexamine the impact of the potential adverse effects of these agents not only on sexual function and psychological well-being, but also on other health concerns such as diabetes, bone metabolism, vascular disease, dementia, and cerebrovascular disease. "Physicians bear the responsibility to give serious consideration to these adverse and sometimes debilitating and persistent side effects on patient health and discuss the potential adverse effects of these agents with their patients prior to commencing therapy." PFS occurs in men who’ve taken finasteride to treat hair loss or enlarged prostates. Reported symptoms include: loss of libido, erectile dysfunction, depression, suicidal ideation, anxiety, panic attacks, Peyronie’s disease, penile shrinkage, gynecomastia, muscle atrophy, cognitive impairment, insomnia, severely dry skin and tinnitus. The condition often has a life-altering impact on victims and their families, such as job loss and the breakup of marriages and romantic relationships, while also being linked to suicides. In March 2015, the U.S. National Institutes of Health listed PFS on its Genetic and Rare Diseases Information Center, noting that "some patients who have taken finasteride have referred to side effects such as sexual dysfunction and depression (sometimes severe)... Studies sponsored by the NIH and other organizations are underway to better understand the effects of 5-alpha reductase inhibitor drugs."